I recently found this video we shot of Daniel Executive Pastry Chef Sandro Micheli at the Top 10 Pastry Chef Award ceremony. This chocolate-centric plate was one of my favorite pastries of the night. It looks deceivingly involved although it looks simple. He says it was inspired by a childhood candy bar memory. Enjoy! 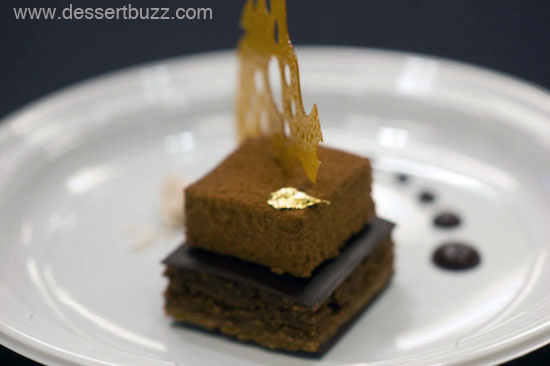 More coverage of the Top 10 Pastry Chef Awards: 2012 part I and 2102 Part II, 2011, 2010. Follow DessertBuzz on Twitter for all your NYC Pastry news. Daniel’s website is here. Waouh, this dacquoise looks amazing! Thanks for sharing this. Daniel is lucky to have such a talented pastry chef. He is lucky Sandro Seems to have a super commitment to excellence! Very earnest as well!